This little beauty has been an interesting challenge to build. All I had to go on were the plans from Model Airplane News magazine, FSP 1105B. Wing Span is 16" and length is 13". Finished weight is supposed to be about 1 oz. Mine is 1.1 oz and I haven't put any finish on it yet. Fuse, tail feathers and wings are from 1/32" balsa sheeting! I should say that mine has yet to fly! Landing gear was perhaps my biggest challenge. It took me a while to figure out from the plans what they had in mind. It is all fabricated from 0.020 wire so is very fragile. I was finally able to draw up my own design that approximated theirs and then using pieces of balsa for jigs and small clamps to hold it in place, silver soldered it together. It's a miracle that it is straight and fits very nicely. I cut the wheels/tires from Dollar Tree foam board, removing a bit of the paper from the outer perimeter to simulate tires, colored with a black felt tip marker. I strengthened the hub area with little disks punched from poster paper using a paper punch. We'll see how it holds up. settled on his ZT 2.4 4-channel Spektrum compatible receiver, 2 micro servos and BL-7MM brushed motor/gearbox/propeller combo. He put all the pieces together including an E-flite compatible 1s battery connector. The receiver and esc combo is about the size of your thumbnail! My wife's sewing box supplied the thread for the wings. It ended up tail heavy, hence the extra tenth ounce from weights installed in the nose. I haven't flown it yet, but it taxis nicely on the kitchen floor! My son is probably wise in advising me to hang it up for a display rather than trying to fly it - given my flight record! One thing I considered while building was how to deal with the fact that I had no adjustable clevises or devices for the control rods on the ailerons and rudder. There was a z-bend at each end. Finally I decided to try mounting the servos with Velcro. That would allow me to physically adjust their position. 11/26/14: Went to Calvary Community Church gym and did a maiden flight. Tried taxiing first. Had limited rudder control so changed the linkage to the outer hole in the servo and that helped a lot. More throttle and it started to lift off and then just quit. That happened about three times before I realized that it really was quitting rather than me panicking and killing the throttle. Tried a larger battery and it lifted off smoothly. I was so fixated on the plane itself that I didn't see the wall coming! It was about three feet off the floor when it hit. But fortunately it did very little damage. The balsa motor mount broke. It was very easy to repair and beef up later at home. The plane felt good while flying, CG seemed OK and the plane wasn't favoring one direction or the other so the wing must be reasonably straight. So I am excited and pleased. Lessons learned: Need at least a 150 mAh battery. Need to remember to watch for walls! The use of Velcro to mount the servos turned out to be a good choice as it allowed me to make the change in linkage onsite. And it appears that the mounting is solid enough to handle the plane which was another concern I had. 12/10/14: Have now repaired the motor mount. Hate to admit it, but it was a poor design (mine). Haven't had opportunity to try it out since. The new motor mount also has room to add more weight to the nose if needed. ​10/16/15: With indoor flying season back I decided to see what I could do to make the micro eindecker flyable again.​ Clearly the Velcro mounting of the servos for the rudder and elevator was not working. 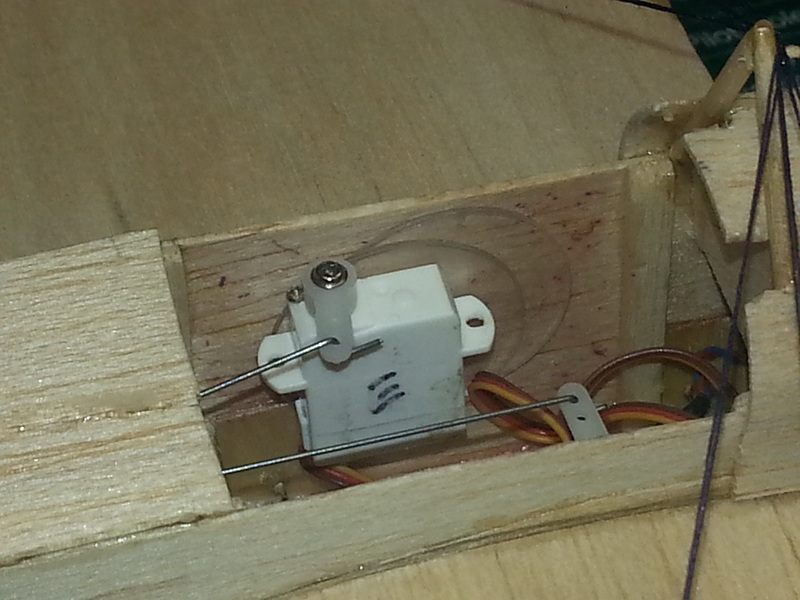 The servos would not stay "rigidly" affixed in position so I really didn't have precise control movements. It has set like that for months. ​Finally a few days ago I got it down and put some more thought into it. This is untested in flight but what I ended up doing was painting the inside surface of the fuselage with sanding sealer where the servos mount so I could mount some Scotch Restickable Dots. That seems to allow me to "stick" the servos in place and they stay put. But I can remove and restick them if needed to trim the control surfaces I'll report back on the success or failure after I give it a flight test. But I'm hopeful.